Beautifully written article by Kathy Borsuk, photos by Davidson Louis, courtesy of Times of the Island, TCI. FOOD FOR THOUGHT – The joys of native restaurants in TCI! Many native restaurants are a family affair. Whether it’s conch salad, pea soup ’n’ dough, stewed fish or the ubiguitous peas ’n’ rice, the native food of the Turks & Caicos Islands is unique, rather unusual, and not what you’re likely to find at home. I’ve long been a fan. But I remember the days when the country’s fancy “resort” fare threatened to upstage its down-home delicacies. That’s why this food story was a joy to write. Here, we showcase three local restaurateurs who are eager to claim and showcase their culture’s culinary roots . . . often drawing on family tradition and skills, with tasty results! I arranged to meet Janardo Laporte at Fresh Catch, his restaurant in The Saltmills, the day after an island-wide, twenty-four hour blackout. Janardo was a little rattled, having just lost thousands of dollars worth of fresh seafood, brought in by South Caicos fishermen, and he had to spend an equal amount on a generator to keep his remaining stock frozen. We laughed a bit, recalling that in his parent’s restaurant’s heydays, the power used to go out on a regular basis. Janardo inherits the legacy of Fast Eddie’s, an Airport Road institution on Providenciales since 1982. I remember going into the large, bright, plant-decorated dining room and speaking to either his father, Eddie or mother, Jacynth, about what was on the menu for the day. Each meal felt cooked just for us, and if it wasn’t too busy, usually included a long discussion on island goings-on. Eddie was the country’s first local chef, working at the Third Turtle Inn during the 1970s and later ran his own restaurant with a pleasant mix of professionalism and casual charm. Now I know where all that tasty history has been resurrected. Janardo explained that he worked at Fast Eddie’s and cooked under the wings of his parents since he was a young boy in short pants. He grew up to be passionate about cooking and eventually “stole all their recipes” when creating the menu for Fresh Catch and training his chefs. Fresh Catch’s menu emphasizes, obviously, fresh seafood prepared island-style. You’ll find blackened grouper, grilled lobster, conch fritters, cracked conch and conch chowder, with barbecue ribs, souse, burgers and chicken wings thrown in for good measure. But be forewarned on Fridays! Jacynth’s “pea soup ’n’ dough,” a hearty island staple, incites madness with the locals at lunchtime, and it doesn’t last long. Fresh Catch is gleaming-clean, modestly decorated with photos of island scenary, and offers attentive service and a special surprise on Wednesday nights. Besides a value-priced island buffet, you’re likely to find the proprietor (a talented musician) playing the sax, his occasional night job at Grace Bay Club, Hemingways and Beaches. For more information, call (649) 243-3167. Preparing to interview the Turks & Caicos’ first (and only!) television food celebrity, I braced myself to meet a larger- than-life character. 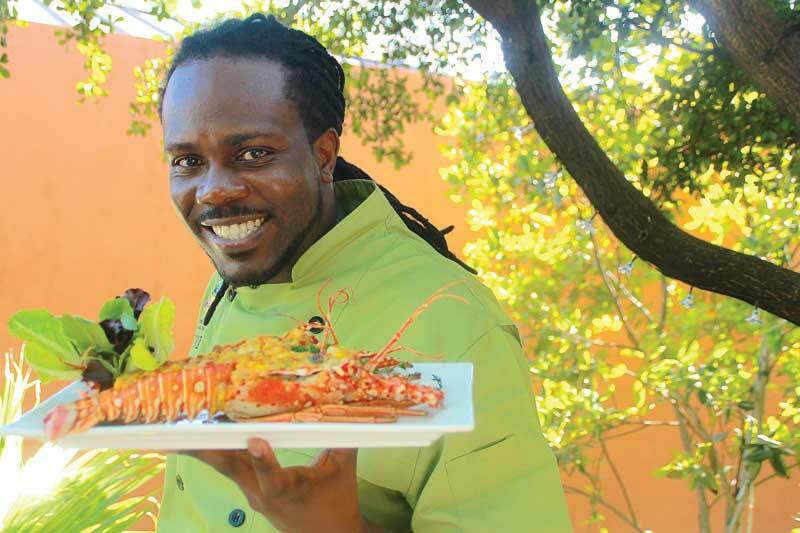 When he arrived in the lush garden dining area of his Grace Bay Village restaurant, Crackpot Kitchen, Chef Nik didn’t disappoint. All six foot four inches of him exuded personality and charm, along with an overwhelming passion for cooking good food, especially the native fare of the TCI. Nikita O’Neil Skippings grew up on South Caicos, cooking for his siblings from a young age. His father is Aldon “Smokey” Smith, an early island restaurateur of Smokey’s on Da Beach (later on Da Bay) fame. Cooking was obviously in Chef Nik’s blood and out of high school, he served a four-year stint at his dad’s restaurant. Here, he says, he learned the proper way to cook and season traditional island dishes. The next step was an internship at Beaches Turks & Caicos to hone his professional techniques, besides absorbing the favorite recipes of a variety of cultures, including Italian and Japanese. 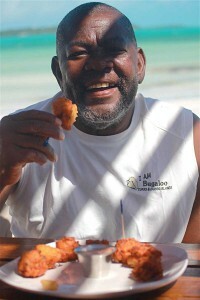 He returned to Smokey’s and later served as sous chef at the Pelican Bay at Royal West Indies Resort. Several shows can be viewed on Crackpot Kitchen’s website, www.crackpotkitchen.com, and they are gems. Each segment mixes solid instruction with Chef Nik’s natural humor, and is entertaining and fun, yet astonishingly professional. Executive Butler Venroy Brown, a longtime associate, appears on the shows to pair wines with the dishes. The next logical step seemed to be opening a restaurant, and when a good location became available at the old Lemon site in the Village at Grace Bay, Chef Nik took the plunge. Crackpot Kitchen, named after his longtime habit of rapping a pot of rice to “wake it up” and the following admonitions not to “crack the pot,” is a unique blend of creatively crafted native fare, entertaining service and genuine island hospitality. The busy chef has also for years operated a very much in demand private chef/catering service. Either Chef Nik or one of his carefully trained associates will prepare and serve a private meal in your condo suite or villa. They are also available for catering jobs for weddings, showers, and parties. Proof of Chef Nik’s passion for passing on the toque are his wildly successful cooking camps. The first camp debuted at the Edward C. Gartland Youth Centre to a small group of eight students. By the second week, fifteen had joined and in the next session, it was standing room only for fifty! The attraction? Chef Nik makes cooking “cool.” Formerly considered a low-prestige job, the charismatic native enabled students to see the possibilities (and high salary) that being a professional chef could bring. He’s since held cooking camps at all the local high schools, including an all-boys seminar in Grand Turk that attracted 350 youngsters! What does the future hold? Season Two of the TV show debuts in April, to be soon followed by a DVD compilation and cookbook. Chef Nik also looks forward to introducing a branded frozen conch fritter batter to local grocery stores, along with his signature jerk and barbecue sauces. The multi-talented chef also hopes to debut the Food Network’s first Caribbean cooking show, a not unlikely possibility! For more information, visit www.crackpotkitchen.com. I’ve known Berlie “Bugaloo” Williams for over twenty years. His original idea of preparing fresh-from-the-shell conch salad was the subject of one of my first stories as Times of the Islands editor in the early 1990s. I still remember visiting his beachfront Blue Hills conch shack, where he waded into the sea, pulled out a live conch, promptly “knocked” it to release the animal inside, and, within minutes, had chopped it together with onion, sweet pepper, lime and seasonings for his signature conch salad. It is a beloved island memory. That’s why I was so glad when Bugaloo’s Conch Crawl opened in November 2011 in a new location in Five Cays, and soon became a success. The years haven’t always been kind to Bugaloo, yet life has a way of bringing the cream to the top, and this lively seaside restaurant is a good example. Bugaloo’s sprawls over the sandy beach near the end of the road winding through Five Cays, Providenciales’ primary fishing settlement. Docks and seafood processing plants flank the property’s far end. Diners enjoy some of the island’s freshest seafood from either a rustic, indoor dining area, the breezy outdoor deck, or beachfront tables planted in the sand just short of the tide. Although well off the beaten path, Mike says tourists “make it a mission to come to Bugaloos.” And once they arrive, it’s well worth the drive or taxi ride. 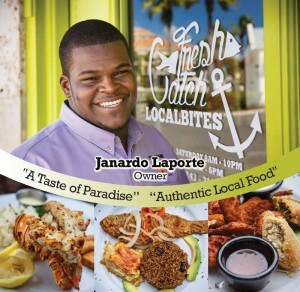 Besides the now-legendary conch salad and conch fritters, carefully tested versions of the original recipes, you’ll find cracked lobster, fried, grilled and stewed fish, coconut shrimp and, for a quirky twist, “gator” tail. Everything is cooked up fresh and tasty, with large portions, traditional sides, and reasonable prices, with plenty of wicked rum punch and cold beer at the ready. In keeping with tradition, you’ll likely find the “conch guy” snorkeling out to the crawl for fresh conch to knock and beat and the “fish guy” busy scaling fish brought straight to the restaurant by Five Cays fishermen. Tourists and locals love to spend a sunny afternoon “liming” at Bugaloos, catching a cool breeze from the sea. On weekends, a crowd congregates to hear the loud and lively bands, including the Five Cays Junkanoo Boys. The beach is a favorite kiteboarding spot, while kids have fun visiting the rabbits, ducks, and baby goats, with future plans for tarpon in the on-site ponds and “hook your own” lobsters. Also new this season are Fire Hot Fridays, featuring an outdoor barbecue, flaming drinks and fire dancers, destined to be THE place to go on Friday evenings. Mike says the community of Five Cays has embraced the restaurant with pride and protection, and it, in turn, has brought a fresh vitality to the settlement. Mike and Bugaloo make it a policy to hire from the neighborhood, not only keeping the fishermen busy, but purchasing bread from the local bakery and ice from the grocery store. I suspect Bugaloo is a bit surprised at his growing celebrity. (The restaurant sells t-shirts, hats, and cupholders bearing his name and likeness.) But I couldn’t think of a better place to retire, or legacy to leave. For more information, call (649) 941-3863.